Well it is Monday again. I hope you’re week is off to a good start. You know what would make it even better? 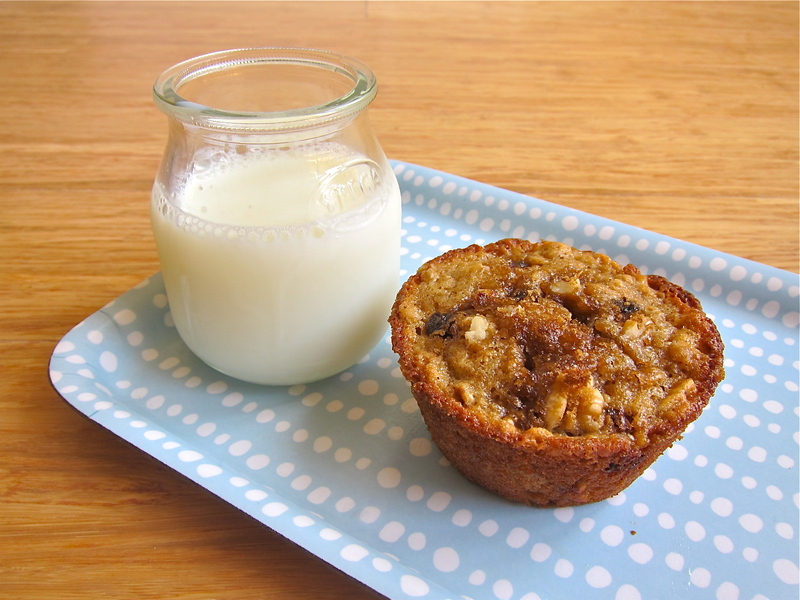 It would be even better if you were eating an oatmeal cookie muffin with an ice-cold glass of milk. Right? Cookies and milk are great, but cookies in a cute and tasty breakfast package are more my style. So I took my favorite oatmeal cookies raisins nuts and all and muffinized it. I sprinkled a generous amount of brown sugar over the top before baking to create a nice crispy edge to the muffin reminiscent of a cookie. Rolled oats, buttermilk, dark brown sugar and butter melt together to create a spongy soft muffin. Bursts of juicy sweetness come from the raisins and a nice crunch from a mix of toasted almonds and walnuts. I added a hint of cinnamon to round it all out. They really do taste just like an oatmeal raisin cookie only fluffier. Cookies for breakfast; it’s a good idea! 2 Mix together the rolled oats, flour, brown sugar, salt, baking soda, baking powder, cinnamon, walnuts, dates, and raisins. Add the buttermilk, egg, vanilla extract, and butter and stir together. 3 Be sure not to over-stir, stir just enough to barely bring the ingredients together. It should be thick and gloppy. Scoop into prepared muffin tray and sprinkled tops with dark brown sugar. Bake for 20 minutes or until a toothpick comes out clean. Cool in the tray for a minute or two before transferring to a wire rack to cool completely. Previous PostPrevious Short Cake LA Winner! Would love to have this muffin… now! this is the muffin recipe i’ve been waiting for! Great idea transforming the muffin into a cookie. I’d suffer through the raisins in this version! Love the crispy edge to the muffin…very much like a cookie. Your muffins look so chewy and lovely! I’m all for cookies for breakfast!! These muffins sound absolutely divine. I can actually taste the flavors just reading it. Yum! Your muffin looks outstandingly caramelized. YUM!! oatmeal cookies are quite possibly my favorite cookie! loving this muffin! I would totally make these with chocolate. Great start to the morning! Hi, i just found your blog, and boy did it make my day :). I can’t wait to bake those Muffins!